Rickreall, Oregon – At Eola Hills Wine Cellars, this year is the winery’s 30th Anniversary year and it will be one for the record books. The winery recorded another early harvest, picking seven tons of estate grown Pinot Noir grapes from our Fossil Block at Legacy Estate Vineyard on the morning of August 29. The early harvest was to ensure optimal ripeness of these grapes destined to become a Blanc de Noir sparkling wine. An early harvest was key to ensure the grapes’ Brix was no higher than 19, and came in perfectly at 18.7, optimum when making sparkling wines. It was an early finish too, as all our contracted fruit arrived at the winery before the end of November! “The beginning of harvest was one of our earliest ever, with 2016 being the first time in our 30 year history that ALL of our estate fruit was picked before October 1st:” Noted Vineyard Operations Manager, Jim Huggins. Several factors have led to the winery’s bumper crop, beginning with warm and dry Spring conditions that contributed to early bud break and good fruit set, followed by a warm, dry Summer that also contributed to an early and abundant crop of beautifully mature fruit. The crop experienced little damage by birds, as early-ripening fruit and the resulting early harvest meant that birds had not yet arrived to feast on their favorite fruit! 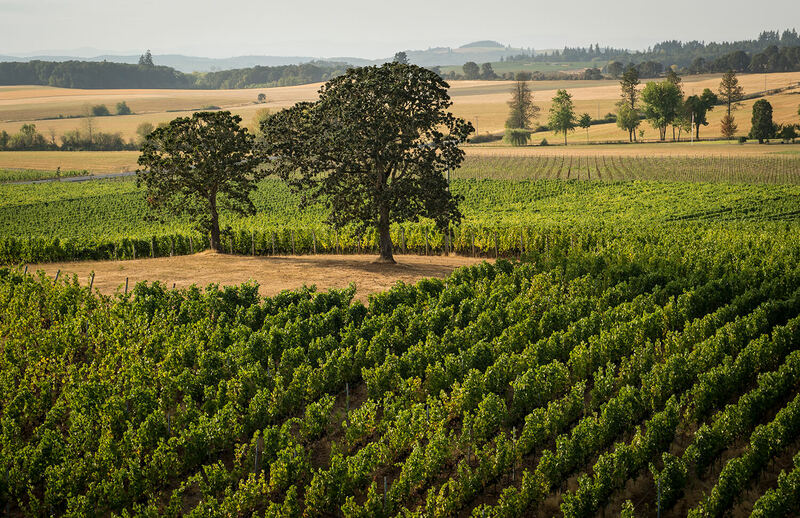 At our 160 acre Legacy Estate Vineyard, the winery’s newest vineyard, where planting began in Fall 2008, young vines produced large yields after back-to-back ideal growing seasons. Our Estate blocks of Pinot Noir and Pinot Gris vines exceeded yield projections by over 10%. The 2016 harvest follows exceptional harvests in 2014 and 2015 – all three strong vintages and “big and beautiful” in the words of Steve Anderson. Founded in 1982 by Oregonian Tom Huggins and 11 investors, Eola Hills Wine Cellars is one of the largest locally owned wineries in Oregon. It owns, leases and farms approximately 275 acres of premium wine grapes in the Eola-Amity Hills sub-appellation of the Willamette Valley AVA and surrounding areas, and produces close to 60,000 cases a year. Its estate-grown Pinot Noir is the 2nd most popular Pinot noir wine sold in Oregon (A.C. Nielsen, October, 2016, for the last 52 weeks). As long-term farmers and thoughtful stewards of the land, the team at Eola Hills Wine Cellars is committed to sustainable wine grape growing and wine production, and takes pride in being locally owned and operated.